You can reveal this card in your hand; your opponent randomly chooses 1 card from your entire hand, then you discard the chosen card. Then, if the discarded card was not “Danger! Mothman!”, Special Summon 1 “Danger! Mothman!” from your hand, and if you do, draw 1 card. If this card is discarded: You can have both players draw 1 card, then both players discard 1 card. You can only use this effect of “Danger! Mothman!” once per turn. Happy Halloween! Danger! Mothman! is a Level 4 Dark Insect-type monster with 1800 Atk and 400 Def. The stats are very standard, but standard is standard for a reason. It’s good that Danger! get just a solid Normal Summon if they want. It of course has the standard Danger! effect which is still good. Then if Mothman! is discarded you get to have both players draw a card and then discard a card. Dark World Dealings on legs is cool, but nothing we haven’t seen before. This gets sided out in the mirror. Worth running in the deck and worth looking at today. Run 2 to 13. The second of the four new Danger! monsters is here for Halloween, and probably one of the more fitting ones for the holiday, Danger! Mothman! Mothman! is a Level 4 DARK Insect with 1800 ATK and 400 DEF. ATK is good on a Level 4, DEF is poor. Insect is supported very well, but I don’t think much of the Insect support will make big splashes with Mothman!, but DARK is a great attribute again (I feel like I say that a lot about DARK). Level 4 is the best level in this game probably. Mothman! has the standard Danger! effect of the reveal, discard, summon, draw, etc. Mothman! 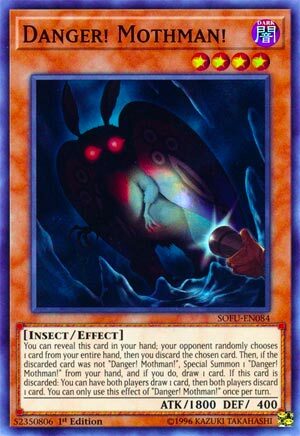 also has the effect that when discarded, you can have both players draw 1 card and then discard 1 card, and this is a hard once per turn effect for Mothman! Well Dark World Dealings is still a good card, so I guess they put it in monster form. This can let you discard the Danger! of your choice if you revealed Mothman! to try and summon it, but your opponent selected it. It isn’t a bad card, worth having a copy or two in a pure Danger! deck and Danger! variations based on what you’re mixing Mothman! with. Pretty good card and it is searchable in the Danger! archetype like Dark World Dealings is in Dark Worlds. Art: 4/5 If the recent meme has taught us anything, it’s that moths love lamps. Danger! Mothman! is definitely a welcome addition for Danger! players. We get a solid attacker here, and at only Level 4, with his 1800 attack (400 defense) still Dark, which we rather appreciate, and as you might guess a moth to be, an Insect. So, we’ll skip the rest of the week the standard ‘reveal/discard/special summon/draw’ that’s common on all these cards, cause I count on you to be intelligent enough to remember. This card has the effect additionally of if discarded, then both players both Draw and then Discard 1 card from their Deck. This effect IS optional, which is worth noting. This effect does still help you, discard a Danger! card of your own to cycle something else from the Graveyard back to your Hand, or even Special Summon something (back) to the Field. Plenty of Decks can make use of a Draw AND a Discard, so letting your opponent do that too is a bit of a risk. But it’s a balanced risk for a player using this theme. It can’t be all advantage all for the player all the time. Honestly, I appreciate a balance like that in the game. Art: 5/5 Very appropriate for Halloween, no? I’m betting the person who found this creature, as well as the person inside, wish they hadn’t.